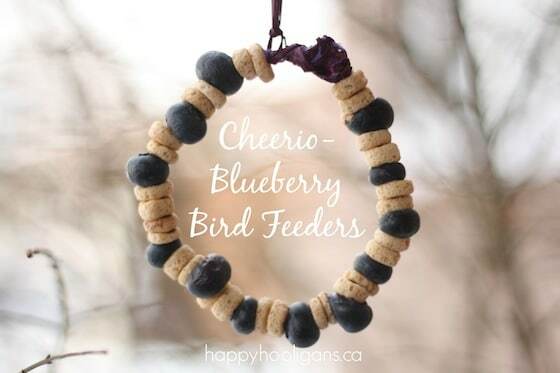 Homemade Bird Feeders with Cheerios and Blueberries – a fine motor activity for kids. Every winter here in my daycare we make homemade bird feeders using materials that we have around the house. In the past we’ve made Cheerio bird feeders, orange cup bird feeders, feeders with grains and fruit, and a milk jug bird feeder. Making a homemade bird feeder with your kids is a fun way to teach your children the importance of helping our your local birds when their food sources become scarce in Winter. 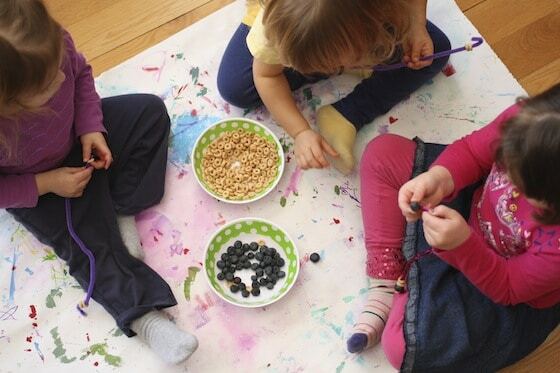 Today, we’re making our homemade bird feeders with Cheerios and blueberries and pipe cleaners. This is a great fine motor activity, and a good way to use up some fruit that’s past its prime. For your convenience, this post contains affiliate links. When you shop through these links, I receive a small commission from the purchases you make. Thank you! Your support is appreciated! I bent one end of each of the pipe cleaners so the fruit and cheerios wouldn’t slide off when the hooligans were threading them. The children then threaded their berries and cereal onto their pipe cleaners. 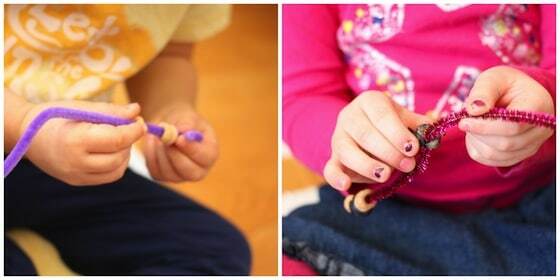 The older children enjoyed some patterning while they were threading, while the younger ones were frequently caught snacking on their supplies. When the kids had their pipe cleaners loaded up, I twisted the ends together and bent their feeders into circles and hearts. I tied a long length of raffia to each feeder and tied a bow. Then we took them out into the yard and hung them from the trees. I love it. 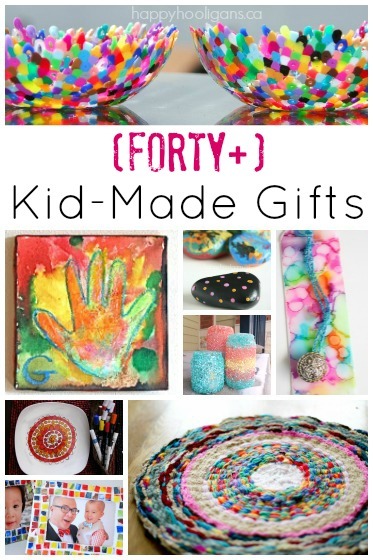 My 3 year-old will love making these and I’ll love that he is working on his fine motor skills. And, I know the birds will love it because we are about to get more snow today! Beautiful and I think our birds will love them! Shared! 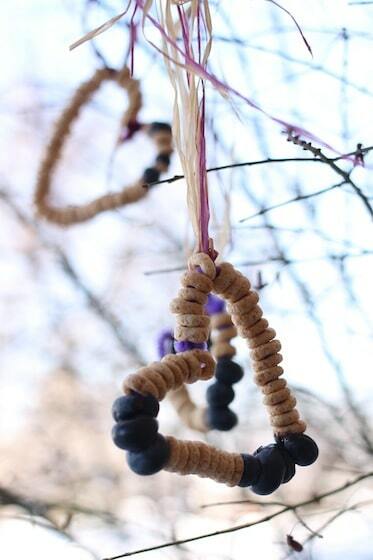 Thanks for this great alternative to the traditional peanut butter-birdseed bird feeders! 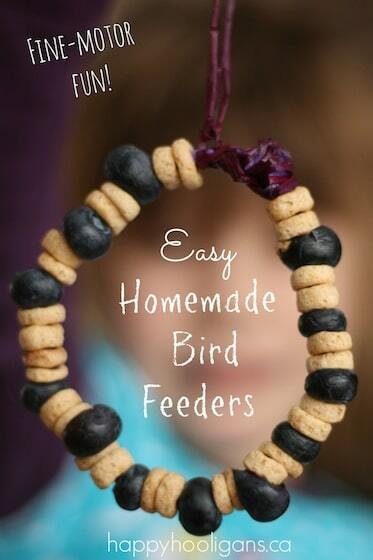 For the many kids who have nut allergies, this is a wonderful way to feed our feathered friends safely! I can’t tell you how much I love this! 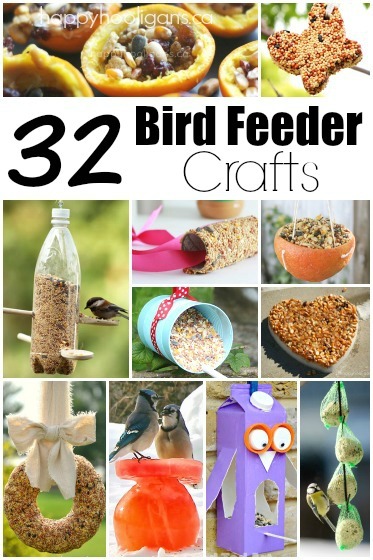 I really appreciate “useful crafts” and my boys will love feeding the birds! (They really enjoyed our last homemade bird feeder, but it was a messy project.) 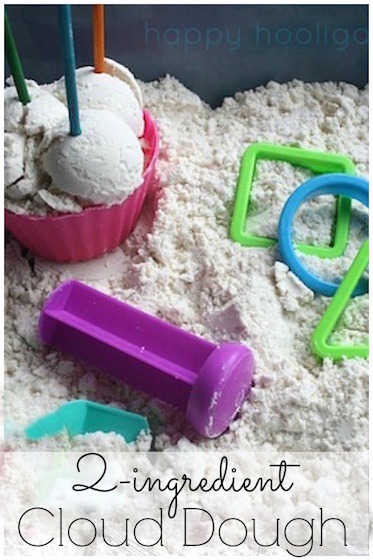 I am featuring this on Makeovers & Motherhood’s Welcome Party Wednesday Link-Up this week! Thanks for sharing! Adorable! Bet the birds love them too! 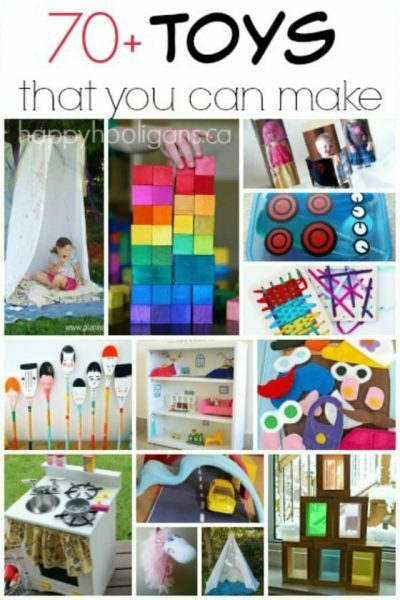 You were featured on Mom’s Library this week! Will the birds eat the blueberries once they are frozen? We live in Canada so the berries will absolutely freeze. Yep! I’m in Canada too, and we’ve been having sub zero temps for weeks now. Hasn’t this winter been something, Marilyn? I know! I’m in Ontario too, Maureen! It’s ridiculous this year! Thank you for the idea! 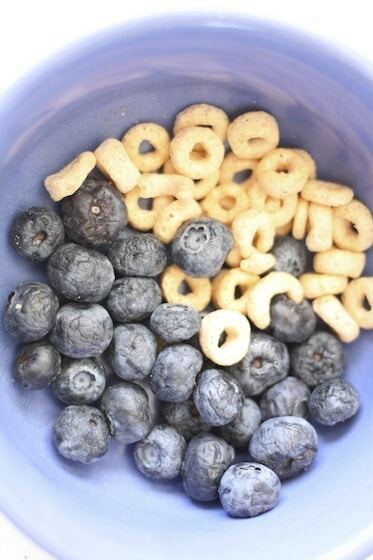 We chose blueberries for our fruit/vegetable of the month so this activity went well with that choice. 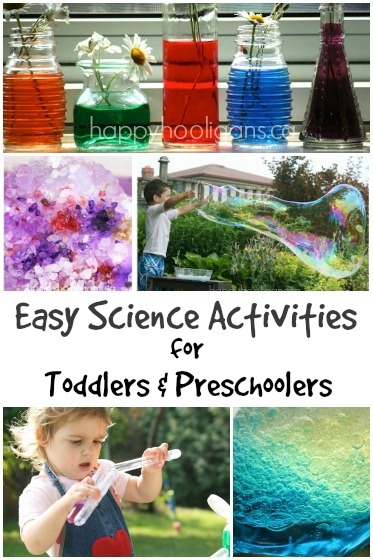 We did this activity with toddlers for a local play group. They loved the introduction to pipe cleaners and beading cheerios and berries. 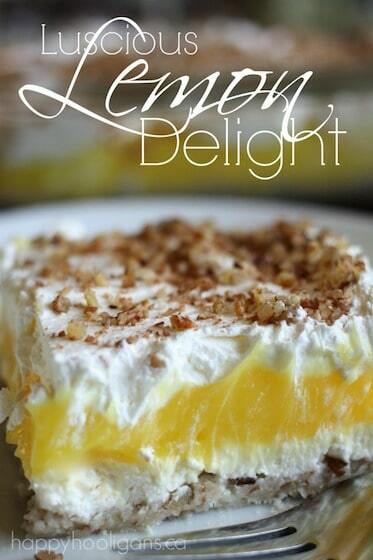 And they ate a great deal of the ingredients which was great since they are healthy. A squirrel got to ours before the birds but he did look appreciative. I’m going to introduce these this week to my hooligans. I haven’t tried blueberries on pipe cleaner but it seems tricky, was it?